Candelaria Medina says her son has come a long way from his middle school days, when he didn’t find the support he desperately needed. Last month he graduated from Bravo Medical Magnet High School and is headed to an East Coast college he picked in part because of its support. 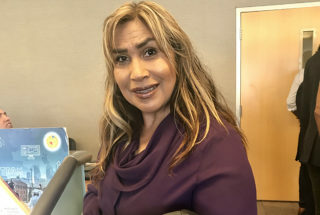 Medina, who lives in a Latino neighborhood in South Central LA, says it is important that other parents educate themselves about the LGBTQ+ community, particularly Latino parents for whom the topic still taboo. That’s why she celebrated the LA Unified school board’s unanimous approval in June of a resolution that commits the district to increase support for LGBTQ+ students, their families, and schools. Medina said the Latino Equality Alliance was the place where she, her husband, and their other four children found support, and in their own language — Spanish. That organization was also behind the creation of the resolution, which was authored by LA Unified board member Ref Rodriguez, who is openly gay. This fall, her son will be attending Hamilton College in New York. Even though he was accepted at top universities in California such as UC Berkeley and UCLA, he chose Hamilton for its support of LGBTQ students. He felt neither his middle school nor his high school gave him the support he needed, his mother said. So it was even more important, she said, that his family rallied around him. “From the time we accepted and supported him as gay, in high school, his academics were great. He’s achieving his dream because he said he feels encouraged knowing his family stands by him,” Medina said. Recognize October as LGBTQ+ History Month. Mandate a high school textbook adoption committee work with the Division of Instruction to include students as part of the committee. Increase LGBTQ+ competency training for educators, staff, administrators, and parents. Add a platform to achieve.lausd.net that shares LGBTQ+ information and resources. Conduct an analysis of single user, all-gender bathrooms and find out if whether they comply with State Law AB-1732, which helps combat gender identity discrimination, describe how schools can request multi-stall all-gender student restrooms, and communicate all-gender bathroom locations and availability. The resolution also requires the superintendent to report within 60 days with recommendations, which the board will consider for implementation by October. “All students have the right to a learning environment where they are treated with dignity and respect. We are sending a clear message that all LA Unified schools are places where LGBTQ+ students are welcome, supported, and valued,” Superintendent Austin Beutner said in a statement after the resolution was approved. Why do you think it was important that this resolution was passed in the district? The bullying and the homophobia that gay students have to face in school is terrible. They are victims of all kinds of abuse, and schools need to know how to deal with that and protect those students. It’s time that schools really support LGBTQ students. My son started suffering abuse in middle school when he was only 12 years old, and he didn’t want me to report it because he felt like the school wouldn’t support him. Latino LGBTQ students also don’t have a system of support at home, particularly in our community. Among Latino families it’s something we hide. We don’t talk about it or just ignore the reality. We as parents and as a community need to be educated on this so there are no more victims of abuse in our society. What kind of support did your son get at his schools? Nothing. It’s like the issue was dead for them. The high school decided to cancel my son’s participation in a JSA Club activity because his participation was LGBTQ-related. He was devastated. I even had to talk to the principal. She understood it was wrong. But those were the kind of things the school would not support. What do you think about the resolution asking the district to include LGBTQ history in the curriculum? When LGBTQ students can hear that they are being included, even a little, for them it’s going to be extraordinary. It’s time that principals, teachers, and school staff be truly prepared to better address the support for those students. What would you like other parents in the same situation to learn about your personal experience? I would love for all parents to be well informed. Whether you have children who are gay or not, we all need to teach our children to respect all people and how to help others who are suffering abuse for being gay. Our children need our love, not our judgment. They need to know that we are on their side even if they’re gay, and schools need to be our partners in better supporting them to feel safe and have successful lives.